Do you love audiobooks? Want to win Ivy Granger series audiobook swag? 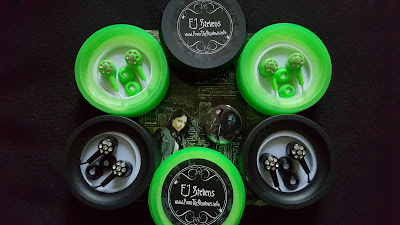 We are giving away an Ivy Granger Prize Pack, including custom earbuds (choice of green or black), an Ivy Granger button, and signed postcard. To enter, please use the Rafflecopter form below. This giveaway is open to US/CA/UK. Giveaway ends January 27, 2016. Want to enter the world of Ivy Granger? SHADOW SIGHT, the first novel in the award-winning Ivy Granger urban fantasy series, is Whispersync for Voice-Ready. Grab the Kindle ebook for $3.99 and get the audiobook on Audible for only $1.99. I would love the black! Thank you E.J. I would like the green. Thanks for the giveaway. If I win, I would like green please. I would like the green ones. I would love the green earbuds. Thanks for the chance. If I win I would like black one.. I'm good with either the black, or the green. Thank you! I would love black. Thank you for the chance. I would like black. Thanks for the chance. Awesome contest! I'd love to win any either color! Audiobooks are how I maintain my tenuous hold on my sanity. Either color is good for me. Thank you for opening a new world filled with great characters. I love your writting! The black earbuds are pretty! I would love the black earbuds. I'd love to win black earbuds! I have no preference really. Just to be able to win this would be a miracle in itself because I don't do too well in giveaways. :) Thank you. Either is OK. Green is my favorite color though. Thank you for the giveaway. The green earbuds are really cool! Green, please. Thanks for the opportunity! I would LOVE the Green!! Its my fave color and they are soooo freaking Amazeballs!!!! I would love to win either color! :) Thanks for the chance! I'd LOVE a set of green (? Neon ). You've got a cool collection 🌬. Green, so I can find them in the dark. Green please! Those would be awesome! I would love the green. Thank you so much for the chance! I'd love the black ones.Thanks for the chance. Love the black ones, thanks. I would love black earbuds!! I'd like black ones, are the green ones glow in the dark though? well designed and unique site. to.. I would like black earbuds, please. Thank you so much for such a great giveaway. Would love the Black ones. I would love the green ones, they look awesome! Green! Would probably be harder to lose them. Thanks for the chance! I would love green please.Thank you! I'd like the black ones! I would love the black ones. Thanks for the awesome giveaway! I would love green!! Thank you so much for this giveaway opportunity!! Green! :D This is a cool giveaway! Fingers crossed! I'd love the green and I can't wait to win. I'd love the black, but those would probably be appropriated by my daughter, so if I won, I'd want the green! Thanks for the opportunity. Black Please. Thank you for the chance. I would like the green earbuds, thank you! It would be great to win this Ivy Granger prize pack. I would like to win the green earbuds, Thanks for having this contest. I would choose the green, its my favorite color!! Thanks for the chance! Black - is the color of my true love's hair! I'd like the green ones please. Not as easy to lose as the black ones. I would choose black if I won thanks for the chance. If I win, I'd like the green ones! I would like the black earbuds. I would prefer the black earphones. I would like the black ones although green would be great too. Green would be awesome to have. I would love to have the black ones if I were to win! Tìm hiểu máy đưa võng tự động cho em bé là gì, địa chỉ mua máy đưa võng cho bé tốt nhất cũng như mua máy máy đưa võng giá rẻ cho bé ở đâu uy tín.